Bringing telescopes where the people are. As a line of tourists snakes across the National Air and Space Museum’s east terrace waiting to (safely) look at the sun through the observatory’s telescope, a bank of dark clouds drifts overhead. 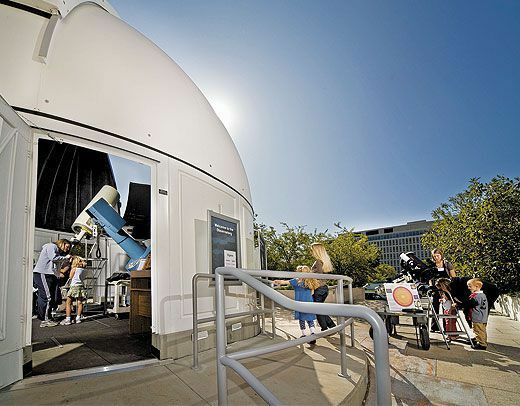 “Could you see anything at all?” Dennis McLaughlin asks a visitor peering into the Museum’s portable hydrogen-alpha telescope sitting next to the observatory’s dome. “It’s a measure of your dedication if you’re willing to wait,” says McLaughlin, one of 20 volunteers who staff the Museum’s Public Observatory Project each Wednesday and Saturday. As the sun enters the active period of its 11-year cycle, visitors are more likely to see sunspots and other phenomena such as prominences (dense gas extended from the sun’s surface, often in the shape of a loop) and filaments (a prominence that is seen head-on, and looks like a barbed wire). Sunspots—which can be 1,000 degrees cooler than the surrounding area—grow as big in diameter as two or three Earths. The observatory, which houses a 16-inch Boller & Chivens telescope, can accommodate 25 to 30 people at a time. “That was the original intent, of course: to create a public space where we could show groups the heavens,” says astronomy curator David DeVorkin. Flights & Fancy: What Would You Send to Orbit?